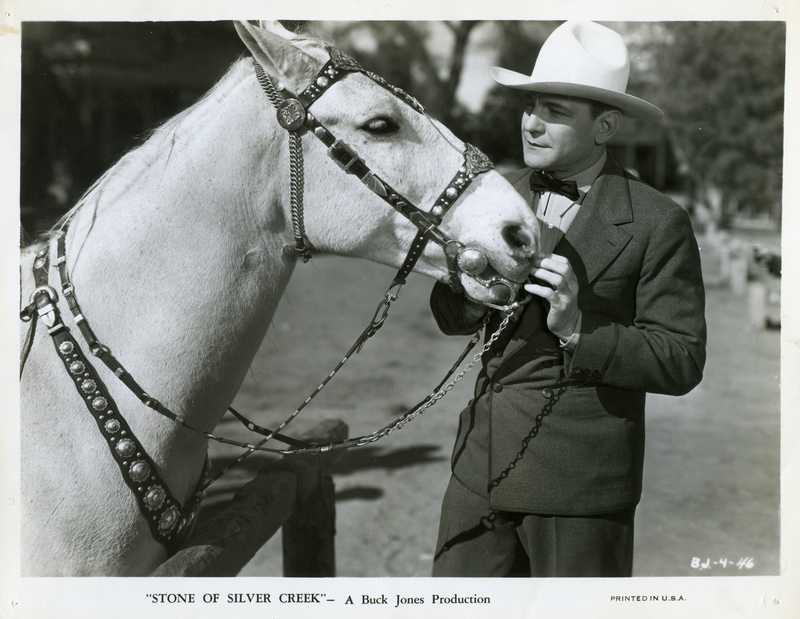 Buck Jones in "Stone of Silver Creek"
Buck Jones and his horse, Silver, in 1935's "Stone of Silver Creek," shot in the Santa Clarita Valley. 8x10 publicity still promoting the original release. 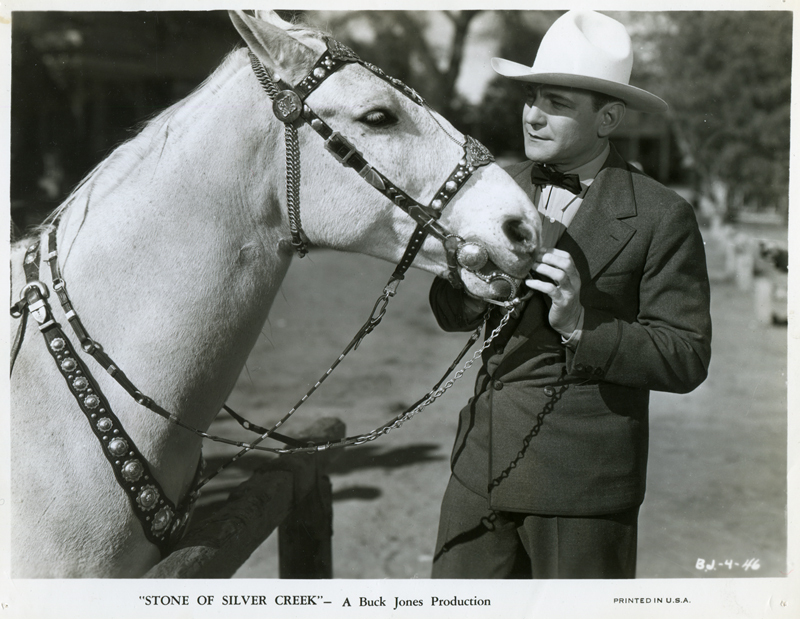 Buck Jones produced "Stone of Silver Creek" for Carl Laemmle's Universal Pictures Corp. The film was shot primarily (and maybe exclusively) in Placerita Canyon, where Jones' production company most likely rented Trem Carr's movie ranch as seen in this production still from the 1948 Artcraft re-release of this picture. "Stone of Silver Creek" premiered April 6, 1935, and was generally released April 15. It co-starred Noel Francis as Lola, and also featured Niles Welch, Marion Shilling, Peggy Campbell, Murdock MacQuarrie, Rodney Hildebrand, Harry Semels, Grady Sutton, Kernan Cripps and Frank Rice. Cliff Lyons performed the stunts. Buck Jones was an A-lister among the "B" Western actors of the 1920s-30s-40s. A popular hero of dime novels and comic books, promoter of Grape-Nuts cereal and Daisy air rifles, Jones frequently starred in films shot at Placerita Canyon and Vasquez Rocks, and he came out of retirement during the war, when younger stars were off serving, to co-star in eight "Rough Riders" buddy pictures for Scott R. Dunlap at Monogram (after Dunlap had made a mid-career move in the 1930s to serve as Jones' business manager). The end of Jones' career didn't come by choice. He died as a result of traumatic burn injuries sustained in the famous Cocoanut Grove fire of Nov. 28, 1942, the deadliest nightclub fire in U.S. history. Flames started downstairs and quickly spread through the Boston nightclub; a single revolving door was the only way out. Jones was counted among the 492 casualties when he died at a hospital two days later. Jones was at the Grove because Dunlap was throwing a party in his honor. Dunlap was seriously injured but survived. Monogram exec Trem Carr was credited (or blamed) for spreading the rumor that Jones sustained his fatal injuries when he rushed back into the burning building to rescue victims, but in fact Jones was trapped behind a wrought-iron railing that incapacitated him in his seat directly across from the bandstand. Born Charles Frederick Gebhart on Dec. 12, 1891, in Vincennes, Ind. — some sources erroneously say Dec. 4, 1889 — he joined the U.S. Army in 1907 at age 16 and earned the Purple Heart during a rebellion in the Philippines. Discharged in 1909, he pursued and interest in auto racing and went to work for Marmon Motor Car Co. He reenlisted in the Army in 1910 and served until 1913, after which he busted broncs on the Miller Bros. 101 Ranch in Oklahoma where he met his bride, Odille "Dell" Osborne. The outbreak of World War I saw him training horses for the allies. Later, a Wild West Show took him to Los Angeles where he got work at Universal as a $5-a-day stuntman and actor. He went to Canyon Pictures and then to Fox Film Corp., earning $40 a week for stunt work. Fox eventually used him as a backup to Tom Mix, raised his salary to $150 a week, and gave him his first starring role in 1920's "The Last Straw." Westerns roared back in the 1930s and Jones did, too. His masculine voice caught on with audiences as he starred in pictures for Columbia and Universal which were often shot in the Santa Clarita Valley. At one point he received more fan mail than any other actor. The early 1940s saw him co-produce a string of movies with his friend Dunlap, who teamed him up with Tim McCoy and Raymond Hatton to form the Rough Riders. Further reading: Buck Jones, Bona Fide Hero by Joseph G. Rosa, 1966. LW2486: 19200 dpi jpeg from original print purchased 2013 by Leon Worden.